IRS records show that, in Tax Year 2014, an estimated 53 million taxpayers contributed almost $255 billion to tax-qualified deferred compensation plans. A popular form of deferred compensation plans, known as a solo 401(k) plans, permits employees to save for retirement on a tax-favored basis. With a Solo 401(k), depending on your salary and age, you could contribute $55,000 per year or $61,000 for those 50 or older in 2018. For 2019, the contribution limit increased to $56,000 or $62,000 if age 50 or over. Elective Deferral (401k) also known as Employee Contributions. The maximum elective deferral is $18,500 in 2018, or $24,500 if age 50 or older. For 2019, the elective deferral increased from $18,500 to $19,000, or $25,000 if age 50 or older. Profit sharing also known as Employer Contribution. This amount cannot exceed $55,000 for 2018. For 2019, this amount cannot exceed $56,000. If your business type is a Corporation, the maximum profit sharing contribution is 25% of gross income and still subject to the above profit sharing amounts. If your business type is a Sole Proprietor/Partnership, the maximum profit sharing contribution is 20% of net income and still subject to the above profit sharing amounts. If you decide to take the full $18,500 for the elective deferral (Type 1), you are limited to making $36,500 in profit-sharing contributions (Type 2) so that your contributions do not exceed $55,000 for 2018. For 2019, If you decide to take the full $19,000 for the elective deferral (Type 1), you are limited to making $37,000 in profit-sharing contributions (Type 2) so that your contributions do not exceed $56,000. Note: Catch-up contributions are allowed for participants who are at least age 50 by year-end. Note 1: The employer/profit sharing contribution can only be applied to the pretax bucket. Note 2: The Roth solo 401k contribution can only be made from the employee/salary deferral bucket, as well as the catch-up bucket if age 50 or older. Therefore, if age 50 or older in 2018 the total Roth solo 401k contribution would increase from $18,500 to $24,500. Note 3: Catch-up contributions are allowed for participants who are at least age 50 by year-end. You may “roll over” into your Solo 401(k) amounts you have in another 401(k), a governmental 457(b) plan or a 403(b) plan. You may also “roll over” amounts you have in an IRA (other than a Roth IRA) into your Solo 401(k). There are no limits on the amount that you can Rollover or Transfer. The solo 401k contribution deadlines depend on your self-employed business type and business tax return due date. Contributions to a solo 401k plan must be made by your business tax return due date plus timely filed extensions. To learn how to shelter more of your earnings, click here. Use our Solo 401 Contribution Calculator. You will get a contribution comparison between a Solo 401(k), SIMPLE, and SEP IRA. Roth solo 401k and voluntary after-tax contributions are not tax deductible, but pretax solo 401k contributions are deductible. Claiming the pretax contribution deduction is driven by the type of self-employed business sponsoring the solo 401k plan. See the following chart to determine where to claim pretax solo 401k contributions. Generally, any business may adopt a Solo 401(k). The business need not assume any particular legal form. Thus, a self-employed business owner, a partnership, a limited liability company (LLC), or any type of corporation (including a Sub-chapter S corporation) may adopt a Solo 401(k). By when does the solo 401k have to be opened? An employer must establish the plan by the end of the tax year for which the tax deduction is desired. For example, an employer operating the plan on a calendar-year basis must complete the plan documentation no later than December 31. I will need to set up account by end of year correct? If you are self-employed and open a solo 401k plan by December 31, 2017, you will be able to wait until next year (2018) to contribute $54,000 plus an additional $6,000 if you turn 50 in 2017 or are already over age 50. This essentially means that you simply need to sigh the solo 401k documents by December 31, 2017 so that you can wait until next year to both open the solo 401k bank account and make both annual solo 401k contribution types (employee and employer). For 2018 I plan on getting paid through an LLC, does this have an effect on my solo 401k if established this year? For 2017 I am an independent contractor with no LLC or corp set up. You can still setup the solo 401k in 2017 under your sole proprietor business. Next year, we can update the plan to list the new self-employed business. All else would remain the same (e.g., same plan name, same bank account for the solo 401k, etc.). The 2018 annual solo 401k contributions would be based on your new self-employment income and you would have until 2019 to make those contributions. Does that mean that for 2017 my wife and I could EACH contribute up to $108k in Type 2 contributions into our respective Solo 401k plans (so ~$54k *2 = $108k theoretical max contributions). Yes provided you each separately have enough net self-employment income to satisfy said contribution amounts. Does my wife need to be paid a salary from the business before the business can make a Type 2 contribution on her behalf? Good question and the answer is yes. In order for either spouse to contribute to the solo 401k plan, whether employee or employer contributions, the spouse that wants to contribute to the solo 401k plan has to have net self-employment income. If my wife already maxed our her Type 1 contribution from her 'day job', and assuming I had the necessary net business income, could I theoretically make the max $55k contribution entirely as a Type 2 contribution? First, your wife’s contributions have no impact on your contributions because the contribution limits are per participant. However, correct that employee contributions (Type 1) are capped at $18,500 for tax year 2018 (plus a $6,000 catch-up if age 50 or older) between all 401k plans. Therefore, if your wife has already maxed out the $18,500 employee contribution (Type 1) to her day job 401k plan, then she can only make the profit sharing contribution (Type 2) to the solo 401k plan and it would be based on her net self-employment income from the business that sponsors the solo 401k plan. You on the other hand, can make both the employee (Type 1) and profit sharing contributions (Type 2) to the solo 401k plan if you have net self-employment income and have not contributed to any other 401k plan. What is the minimum I should contribute every year to keep my Solo 401k in good standing with the IRS? While one of the benefits available under a retirement plan such as a solo 401k plan is the ability to make annual contributions even if you are over age 70 1/2, you are not required to make annual solo 401k contributions in order to continue with the solo 401k plan. do I need to make equal solo 401k contributions for me and my wife or can they be different? Because a solo 401k plan is only for owner-only businesses, equal contributions do not apply; therefore, just one spouse can contribute while other does not. As a W-2 employee, participating in her employer's 401K already, how much can she contribute to our SOLO 401K PLAN each year? She is 58 years old. Your wife’s ability to contribute to a solo 401(k) depends on the self employment income that she receives from the partnership. Specifically, in order to determine how much she could contribute to the solo 401(k) she would take the amount reported on line 14 of her K-1 and reduce it by one half of the self-employment tax. Of that number, she could contribute for 2017: (i) up to $24,000 as an employee contribution (less any amount contributed as an employee contribution to her 401(k) plan sponsored by her daytime employer); and (ii) a profit-sharing contribution to the solo 401(k) equal to 20% of that same number (i.e. line 14 from her K-1 -1/2 of the self-employment tax) provided that her overall contribution to the solo 401(k) cannot exceed $60,000. I wanted to confirm if I’m correct in making contributions into my solo 401K for this year. For this year, I’m guessing I will just deposit my annual contributions into the solo 401K account? Have you made any SIMPLE IRA contributions for 2018? If you have not, do not make it to the SIMPLE IRA if the SIMPLE IRA is also for your self-employed business, as the IRS rules do not allow contributions in the same year to both a solo 401k and a SIMPLE IRA. I set up the solo 401k bank account with Bank of Arizona and I deposited $18k for annual contribution for 2017. Do you need any information on this or would it just be year end reporting? You don’t need to inform us of the contribution or submit a contribution form. However, you will need to report the contribution to the IRS when you file your taxes. Also, you can use the annual contribution form located on our forms page to internally document the annual contribution. Can you count guarantee payments from a partnership for purposes of the solo 401(k) contribution calculation? It depends on whether or not those guaranteed payments are reported on line 14 of the K-1, as contributions to a solo 401k plan must be based on earned income from self-employment activity not passive or investment income. We are an LLC taxed as an S-Corp. It appears that I may make a solo401k contribution for myself and my spouse but we have to take w-2 income from the company, Correct? Correct since earned income for an S-corp is reported on a W-2. Both the employee and profit sharing contribution is based on W-2 wages, and each spouse, provide they receive W-2 wages from the self-employed business, can make solo 401k contributions. I am a cpa - I have a client (s-Corp) who has a solo 401k. They went on extension but there was mixup and the return was filed without a solo 401k deduction and without the contribution being made. Since it is still in the extension period can the contribution be made and the return amended? Yes since a timely business tax return extension was filed. The solo 401k contribution rules allow for contributions of both the employee and employer by September 15 if a tax return extension is timely filed. See IRS Publication 560 for more information surrounding the contribution deadlines. Good question. Yes, you are still considered “covered by a retirement plan at work” even if you are not making solo 401k contributions. While you can still contribute to a traditional IRA, your traditional IRA contribution deductions will be reduced (phased out) if your AGI is a certain amount. I do have a question regarding vesting and contributions. We can have all contributions vest immediately correct? And I can do profit sharing etc without worrying about any Safe Harbor provisions (because this is a Solo 401k). So as long as I do not have any employees I will have full flexibility correct? In short your understanding is correct, as solo 401k is not subject to the safe harbor rules since it is 401k for owner-only employees. Same with vesting, all contributions are fully vested immediately because it is a 401k plan sponsored by a self-employed business with no common law employees. In summary, I think I should be able to contribute more to my solo 401K than is shown in your online calculator because I have already paid all my payroll taxes through an employer so my SE tax due is only $798 (per Turbo tax (not yet filed)) vs. $2,104 (shown in your calculator) which reduces how much it says I can contribute. Good question. While you have already paid all of you payroll taxes (i.e., social security and medicare) through your W-2 employer, this has no impact when calculating the solo 401k contribution as the contribution still requires the reduction of 1/2 of self-employment tax if the self-employed business is a sole proprietorship. In other words, the fact that you have already paid some or the maximum payroll tax through your day job means that you may or may not owe additional social security and medicare tax, but this does not mean that 1/2 of self-employment tax does not need to be reduced from line 31 of Form Schedule C when performing the solo 401k contribution calculation. If I have an existing individual 401k plan at a brokerage, can I adopt your plan as a restatement of my existing plan? Do I need to do that by end of this year in order to make after-tax non-roth contributions (which are not stated as an option in my current plan)? Yes you would need to change / restate the individual 401k to our solo 401k plan this year in order to preserve the right to make Roth and/or after-tax contributions for 2018 by your tax return deadline next year. Because they used code “G” in box 7 of Form 1099-R, that means they already treated the movement of the IRA funds to the solo 401k plan as a nontaxable direct-rollover (IRA to solo 401k plan); therefore, the Form 1099-R that you received from E-TRADE is for your records and does not get filed with the IRS as E-TRADE will also submit a copy to the IRS. Essentially, by using code “G,” they are communicating to the IRS that the IRA direct-rollover check was deposited into the solo 401k account not your personal bank account. For contributions, is the solo 401k also tax exempt for state and local income tax purposes? Non-income tax? I know that since my self-employed business is an S-corporation that the contributions are based upon W-2 earnings, but do they have to come out of payroll or can they be made from my personal bank account? From a Solo 401(k) perspective, what matters is that the contributions (employee and employer) are made based on W-2 wages. Therefore, regardless if the funds first flow from the Corporation bank account to your personal bank account and then to the solo 401k plan, it will still satisfy the solo 401k contribution rules (i.e., both the employee and employer contributions were made by your business tax return due date and were based on W-2 wages from the S-corporation). My LLC filed for a tax extension-does that mean I do not need to make any contributions (including my personal share) until the extension deadline? Self-directed 401k contributions (both employee and employer) deadlines are based on the type of entity sponsoring the solo 401k so you are correct. Please see the following. If the entity type is a Sole Proprietorship, the annual solo 401k contribution deadline is April 15, or October 15 if tax return extension is timely filed. If the entity type is an LLC taxed as an S-Corporation (calendar year), the annual solo 401k contribution deadline isMarch 15, or September 15 if tax return extension is timely filed. If the entity type is an LLC taxed as a Partnership (calendar year), the annual solo 401k contribution deadline isMarch 15, or September 15 if tax return extension is timely filed. If the entity type is a Partnership (calendar year), the annual solo 401k contribution deadline is March 15, or September 15 if tax return extension is timely filed. 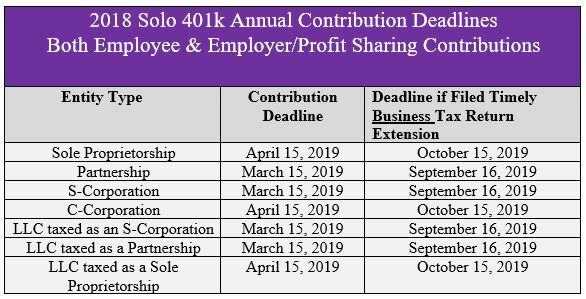 If the entity type is an S-Corporation (calendar year), the annual solo 401k contribution deadline is March 15, or September 15 if tax return extension is timely filed. If the entity type is an C-Corporation (calendar year), the annual solo 401k contribution deadline is April 15, or September 15 if tax return extension is timely filed. I'd like to move ~$35K into my Solo401K from an existing IRA. Would that have any impact on my contribution limits this year? And, is there a certain form I should use? No direct-rollovers from an IRA to a Solo 401(k) plan do not count towards your annual contribution to the solo 401k plan. You can directly rollover unlimited amounts from an IRA to a Solo 401(k) plan without affecting your annual Solo 401(k) contribution limits. We will prepare an IRA transfer form as your solo 401k provider. I have a quick question. Is income earned as a non-professional trustee considered self-employment income which can be contributed towards a solo 401k? No it cannot because the fees received by such individuals are not subject to SE tax and are not earned income for solo 401k or IRA contribution purposes. have an impact on self-employment income; therefore, the owner-only business owner can make annual solo 401k contributions regardless of any Roth IRA conversions processed during the year. Let's say I'm a contractor that works solely for one company. Gross pay is $200k. Let's just say taxes are $20k. Is my net income $180k, or do I deduct out money allotted for 401k pretax contributions and self directed profit sharing? The solo 401k contribution is based on net self-employed income so line 31 of Schedule C. You then plug line 31 into our solo 401k contribution calculator to determine the allowed solo 401k contribution amount, as the calculator will subtract 1/2 of self-employment income tax when performing the calculation. Visit here to view our sole proprietor page. If I contribute to my day-job (full-time employer) 401k plan, can I do the Mega Roth IRA rollover thru my Solo 401k? (IE, contribute the maximum to the other 401k (and get their company match), contribute extra to the Solo 401k plan, and then immediately roll it over to a Roth IRA ? Yes and see the following. The overall limit in 415C (i.e. $54,000 for 2017, and $55,000 for 2018) applies on a per employer basis Provided that the employers are unrelated. Individual has an S-corp side business with no employees that generates self-employment income (i.e. compensation) greater than $55,000. Individual can contribute after-tax contributions up to $55,000 to the solo 401(k) sponsored by side business.